These look pretty much perfect. Proofing in the proofer sure is a benefit. disappointed, because I really seem not to be able to control baking Viennoiserie in it. 10 minutes rest covered with plastic. 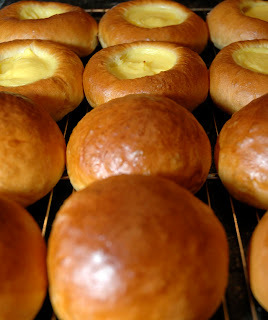 Divide the dough into buns 50 grams each. do this just before putting them in the oven. Proof for about 20 minutes (this might take longer depending how warm it is in your kitchen), egg wash them and bake. 240°C (460F) for about 10 minutes. Like I mentioned before on this blog, I usually use cooked pastry cream, but for these ones I made it easy and used a mix. For baked goods that is okay. That's an interesting method for creating the hole for the pastry cream. Thanks for submitting lovely rolls to YeastSpotting! A matter of loaf and death!